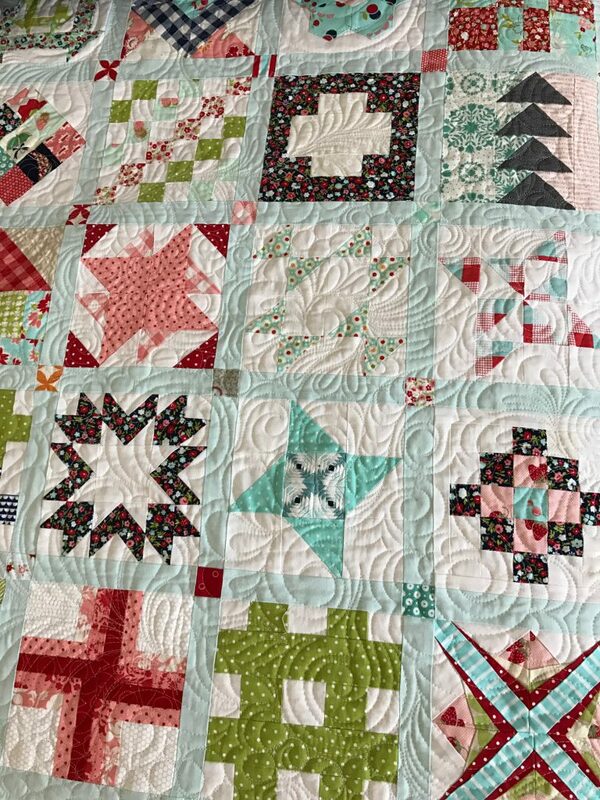 Well I officially have finished my 6″ sampler quilt. 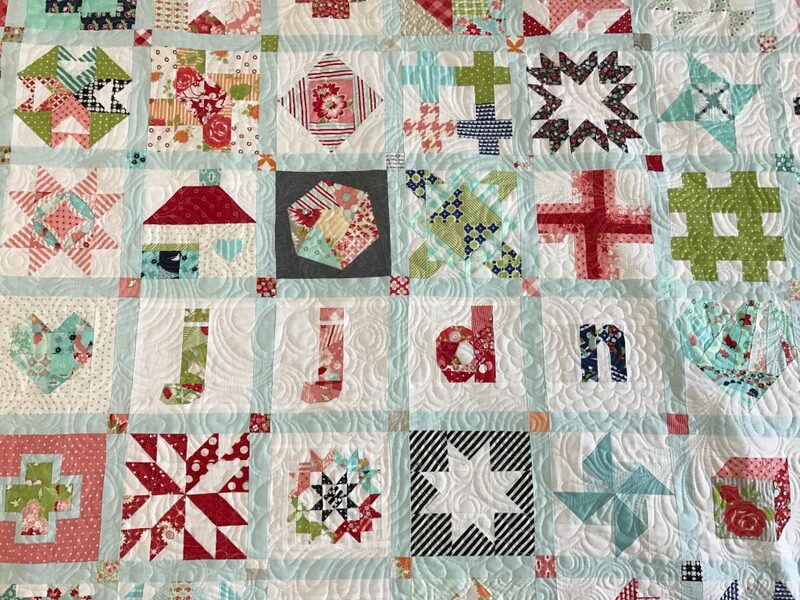 This quilt is one that gets a lot of questions about where the blocks came from. 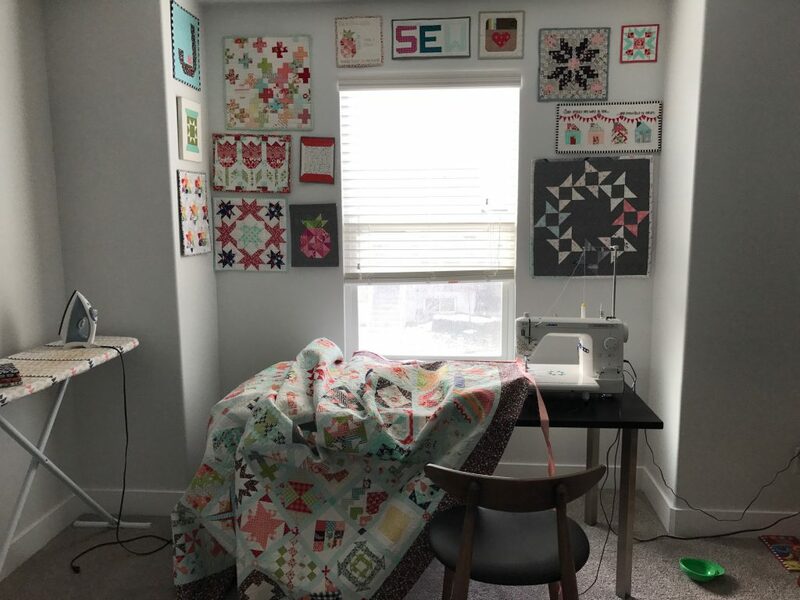 Probably 2/3 of them are from The Splendid Sampler, 35+ are from #jensfillerblocks (all available in my tutorials section), and I think 15-20 are from Tula Pink’s City Sampler book. 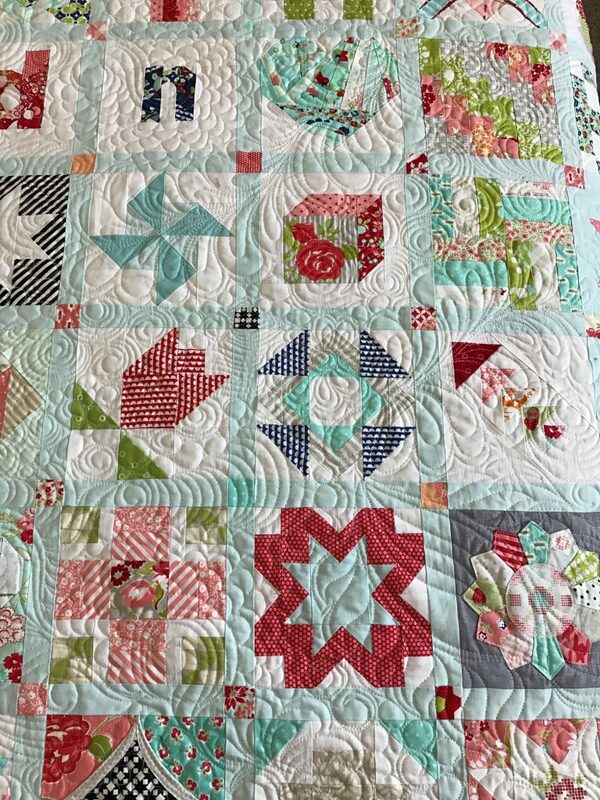 There are 144 blocks in this quilt, with 1-1/2″ sashing (1″ finished) and a 5″ border around the entire thing. 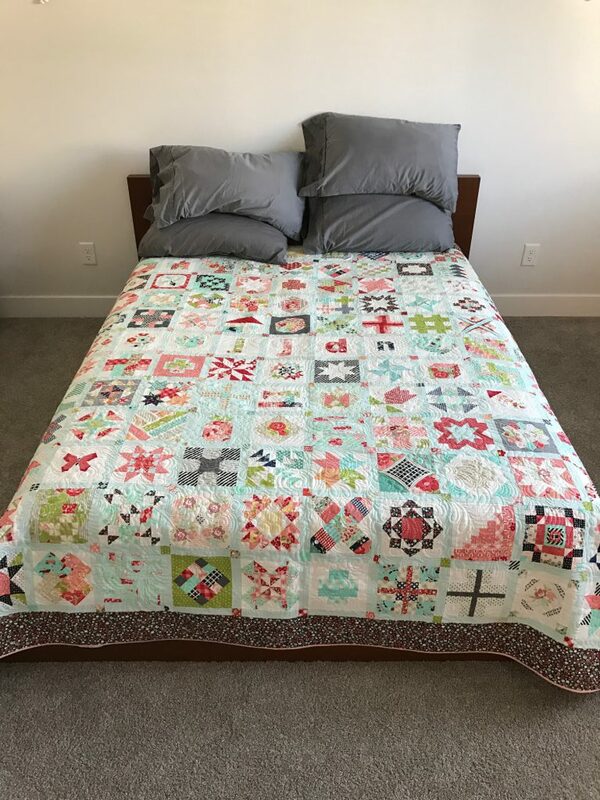 It finished up around 94″ x 94″, perfect for my bed!! It was beyond a labor of love. I cannot even guess how many hours I spent on this, especially with resizing 12″ blocks to fit. 100, maybe? More? All I know is I loved almost every minute of it and I really, really miss making 6″ blocks. They are fast, fun, and very satisfying to make something with pieces so small. 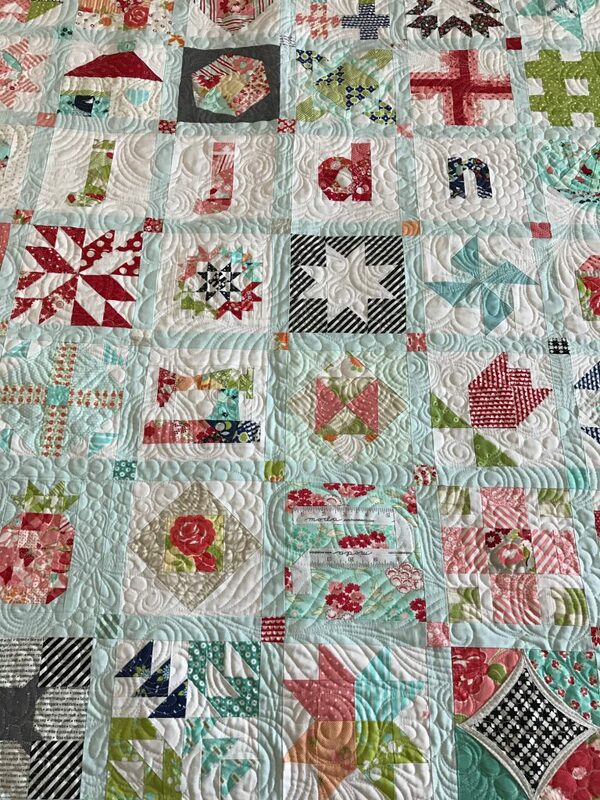 I do quilt a lot of my own quilts at home on my Juki (I also have a few long arm quilters with whom I work), but I knew this one needed an extra special touch. 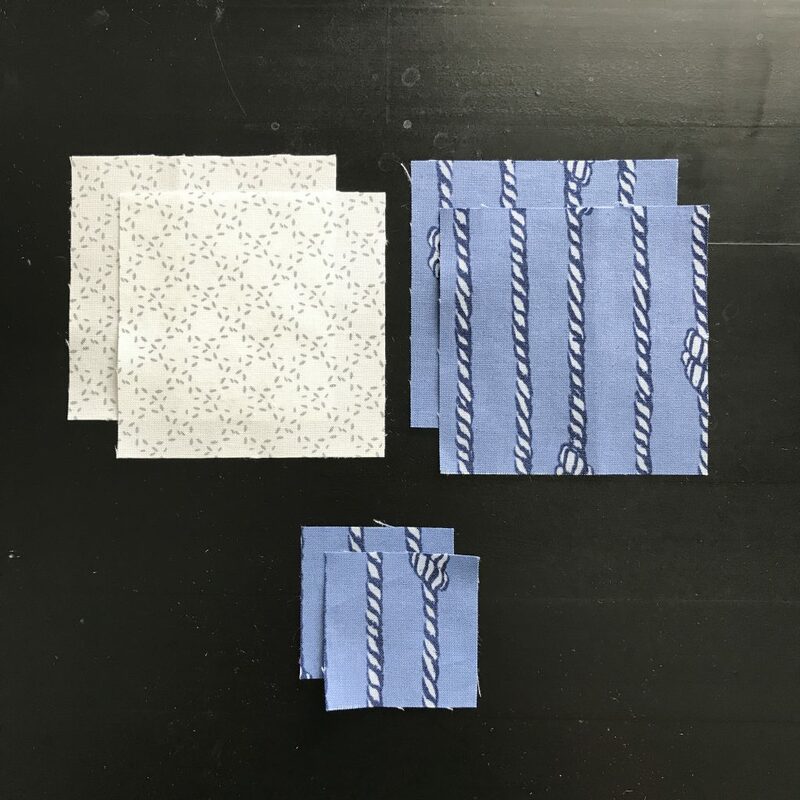 Some quilts just need it. 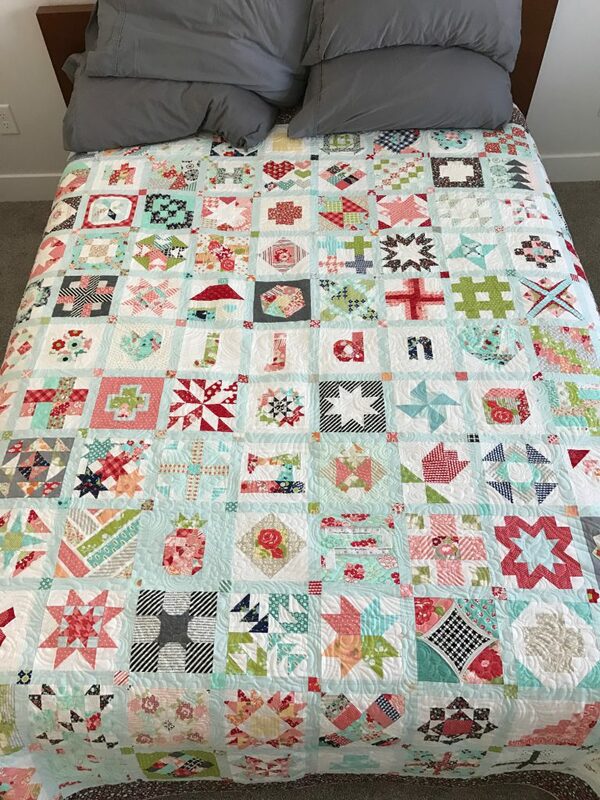 I actually won a giveaway for a $100 credit to Marion of My Quilt Diet and this was the beauty I knew I’d use the credit on to help me make this quilting dream an affordable reality. 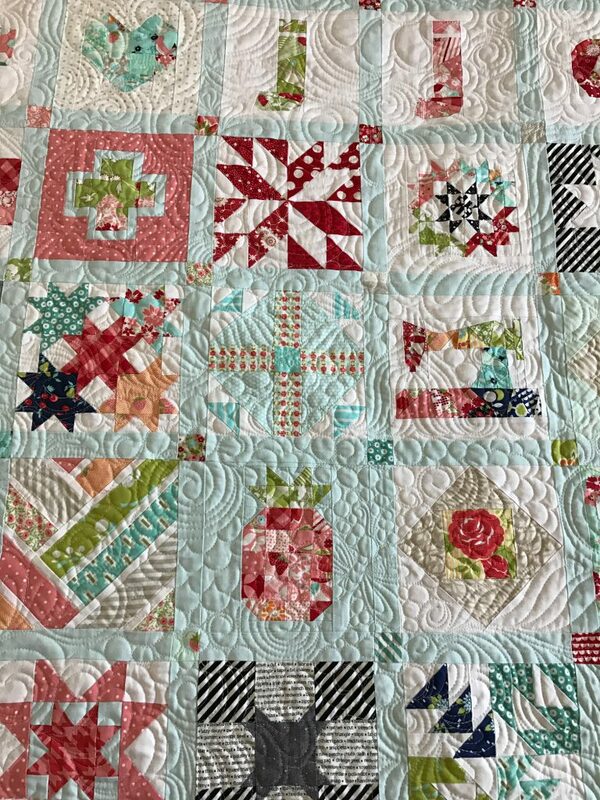 I saved almost all of my Christmas money and used it to pay for the quilting on this. It was worth EVERY penny I paid. I chose a 108″ Moda gray solid for the background mostly because I was feeling lazy and cheap, but it was the PERFECT choice. 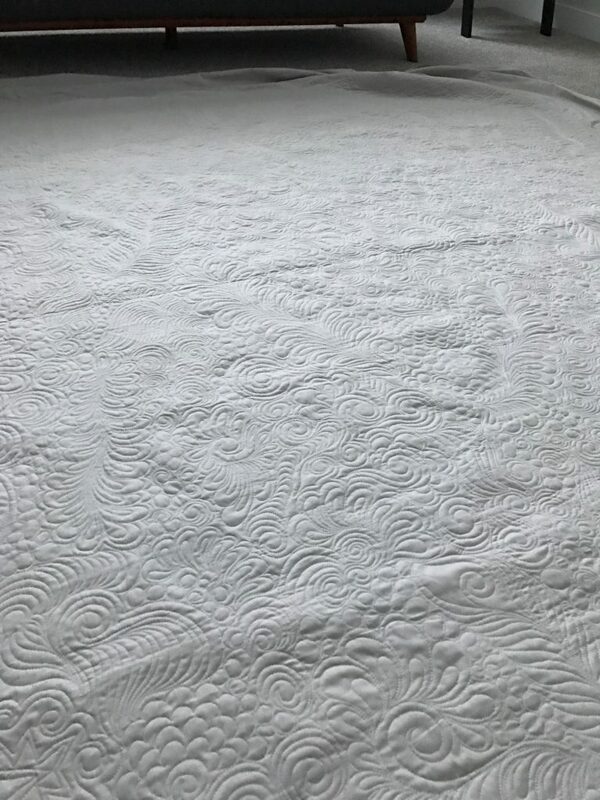 Look at that quilting!!!!!! I chose Marion’s freehand graffiti motif and I could not be happier. She made this a true heirloom for my family to enjoy for generations. That’s the hope, right? 🙂 And now for a dumping of photos because I can’t pick just one or two to share. I am so sad that this will be my last #jensfillerblocks. This has been such a growing experience for me. 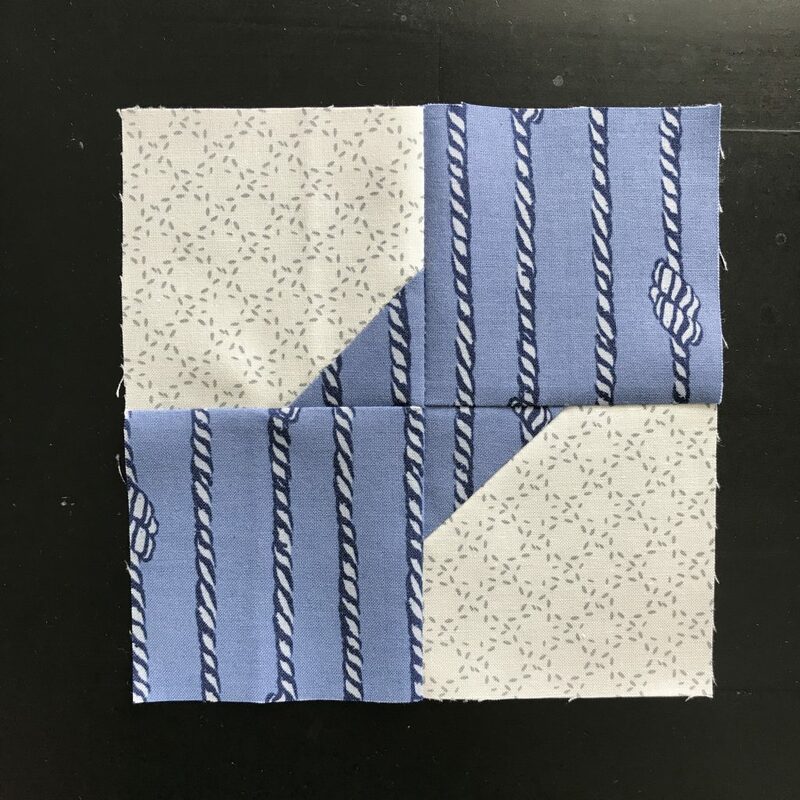 I have learned SO much and gained so much confidence as a quilter by working through these 6″ blocks. 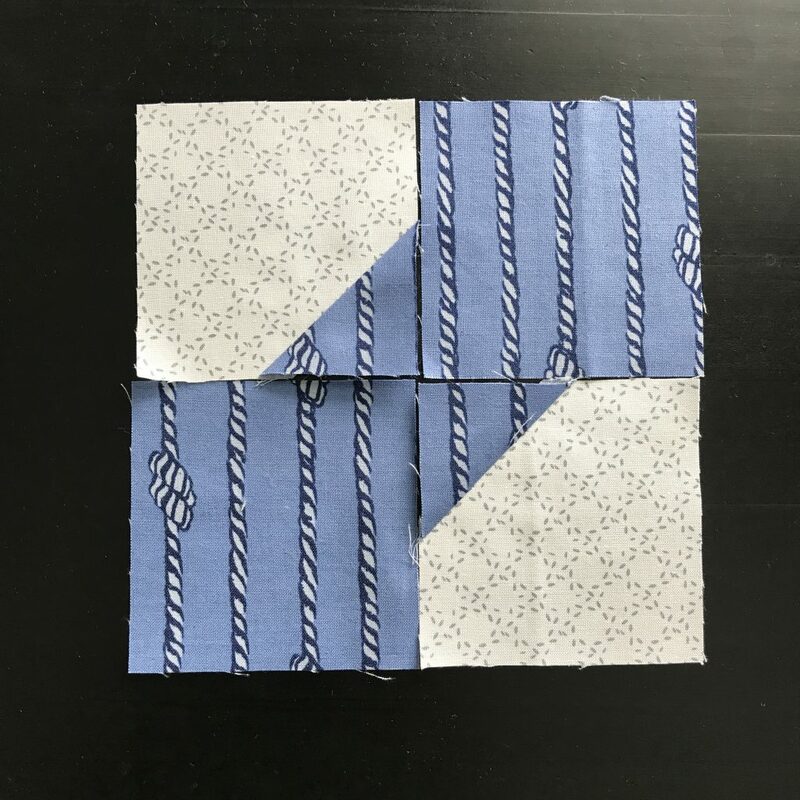 Today’s block is from the ever so talented Nicole Young (aka Lillyella). 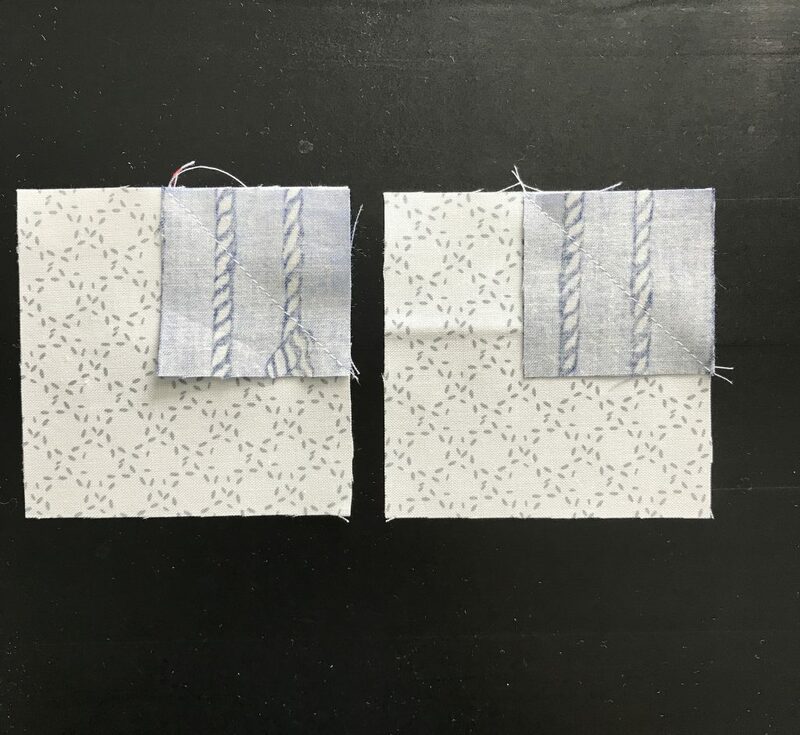 It finishes at 5.5″ so you’ll need to add a small border to make it fit in your quilt. 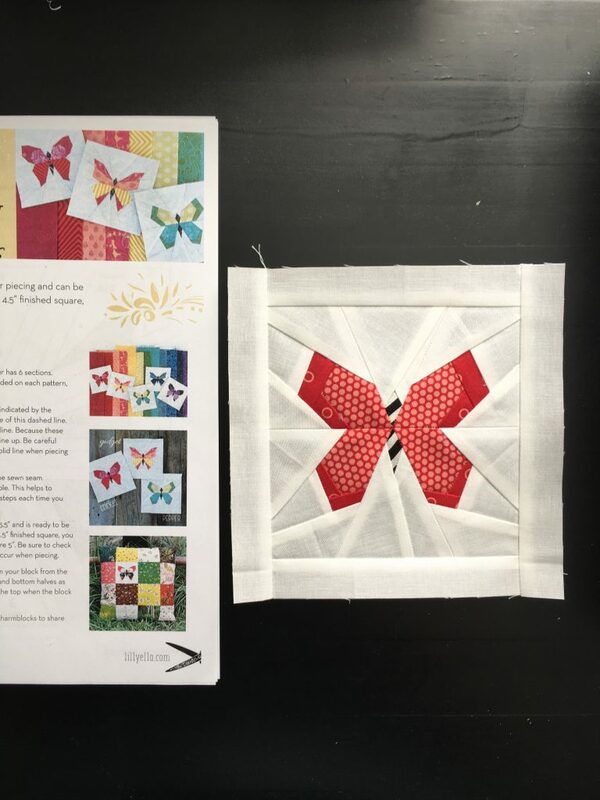 She has provided 3 different styles of butterflies and the paper piecing PDF’s are all free on her site, Lillyella.com. Keep tagging me on instagram and using the #jensfillerblocks hashtag. It truly brings a big smile to my face any time I see one of these blocks.